SYDNEY, AUSTRALIA--(Marketwire - April 14, 2010) - WinZip Computing, a Corel Company, today announced the release of WinZip® 14.5, a new update to its industry-leading file compression software. Optimized for Microsoft® Windows® 7 and featuring an Office 2010-style ribbon user interface (UI), this latest WinZip release unveils numerous key features and offers a more enjoyable, intuitive and streamlined user experience. 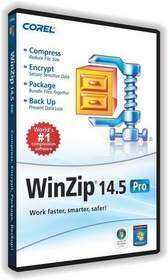 WinZip 14.5 dramatically simplifies file zipping and unzipping for quick, efficient and secure uploading and downloading, email transmission and data backup. "Every day, more and more personal and business information is sent through email and saved on computers and networks. Driven by security and privacy concerns along with the need to maximize bandwidth efficiency and storage capacity, WinZip's versatile file compression, encryption and backup technology is more relevant and in greater demand than ever," said Patrick Nichols, President of WinZip. "Customers tell us they rely on WinZip to save space and time and help them protect their confidential files and critical data. With WinZip 14.5, we've given them what they've asked for -- features that simplify the product, making it easier to take advantage of all its power and value," said Tim Hale, Vice President of eCommerce and Marketing at WinZip. "WinZip 14.5 works the way you think," Hale continued. "Its new ribbon UI puts key features front and center and straightforward options increase user productivity." Visit www.winzip.com/whatsnew145.htm for a complete list of all the new features in WinZip 14.5. WinZip 14.5 is available now with prices starting at $64.95 (AUD) for WinZip Standard and $99.95 AUD for WinZip Pro. Multi-user license discounts are also available. Registered customers of WinZip 14, as well as other WinZip customers with valid upgrade assurance or maintenance, qualify for a free upgrade to WinZip 14.5. Customers of previous WinZip versions not covered by upgrade assurance or maintenance may upgrade for 50% off new license list prices. Visit www.winzip.com to purchase WinZip 14.5, upgrade a license or download a free trial. WinZip(R) 14.5, a new update to its industry-leading file compression software.